After a trip to a car boot sale at Woolpit this morning I left any plan to run until the early evening at 6pm. 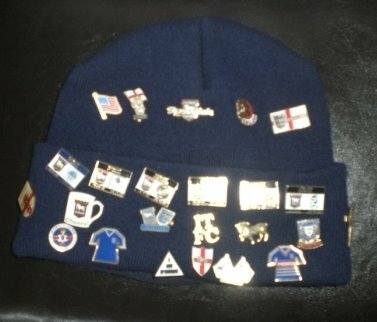 The car boot had been a success and I bought a woolen hat just what you need in this weather! 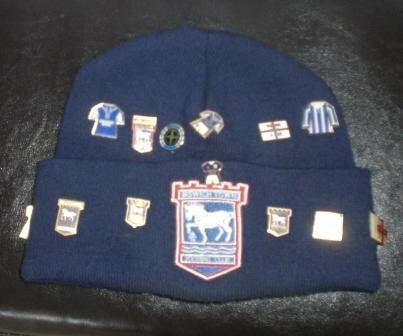 Actually it was a supporter who could no longer afford to go to games at Ipswich Town selling his collection of badges which I debated whether to buy and then did 35 badges and the hat was £20. I thought it was worth it others might not. The weather on Sunday was never particularly bright blue skies and wall to wall sunshine but it was humid hot and sticky. When driving in the car the outside temperature meter recorded 30c or 86 f in Bury St Edmunds. The humidity levels were around 75% when I ran. As a runner the internal battle that goes on in your mind as to whether you can a) get out of the door to run in the first place and b) run a certain distance or time is probably the biggest adversery you will face I find. However after this as a runner you are always battling the elements, whatever the seasons chuck at you. Running in the cold in mid winter may seem daunting but you can always put extra layers on and combat this. Spring and Autumn are just about the best for me and summer is also wonderful but is an adversery to respect. Two conditions can result from running in the heat overheating and dehydration. When you start to heat up the body sweats and more blood is sent to the skin surface where it is cooled. However your muscles demand oxygen and blood to run at a pace and as a result less blood flows to the skin resulting in overheating. I find I slow down in heat as the blood tends to go to the skin more than the muscles in an effort to cool down. In humid conditions like today there was no way my sweating was going to evaporate and therefore give me a chance to cool down so running slowly was my only option. As you sweat and lose fluids from the body dehydration can start to occur. It is the combination of losing both water and electrolytes. I have never enjoyed carrying water on a run but will now plan to do so perhaps a sports drink with electrolyte replacement. I do wear sunglasses but not a hat something else to think about buying along with a bandana perhaps. My concusion is that I could do more myself to combat heat by a little more preparation . Anyone have any good tips on running hats and sports drinks?